SUZI WEISSMAN: The failure to find probable cause to indict the Staten Island cop who was caught on video choking an unresisting detainee (Eric Garner) to death has led to outrage and large protests around the country. Following so closely on the Ferguson Grand Jury non-indictment, the question is raised about how grand juries are being used and underscores the reality that cops are rarely indicted, and that the prosecutorial system in the US is profoundly, institutionally racist. The protests in cities around the country and the support they get from the general population shows people are fed up and losing their fear of confronting the police – who in turn have been delegitimized while the protestors are increasingly legitimized. This is seen in the extraordinary headline of the Daily News (on December 4), an editorial front page statement, “We Can’t Breathe.” Maybe we should just start with this: from Ferguson to Staten Island, what’s the problem with the District Attorneys, Grand Juries, and the failure to bring indictments? ALEX VITALE: Well, I think it’s a mistake to think that that process is going to lead to substantial police accountability. The reality is that there is a fundamental conflict of interest for local District Attorneys, because they rely on the police day in and day out to cooperate with them on investigations and trials, and to obtain convictions, which is really the coin of the realm for District Attorneys. They also often rely on the political support of police and police unions to get elected, and the very nature of the job tends to revolve around a kind of pro-law and order politics. And so we know for a fact that it is very rare for District Attorneys to aggressively pursue these cases, and certainly that appears to be the case in these two most recent instances. 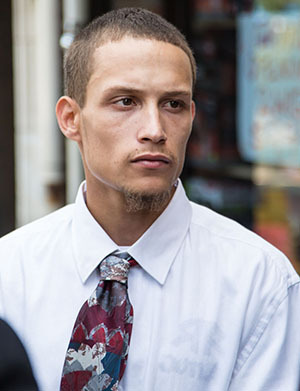 Ramsey Orta, a bystander, was the only person present at Eric Garner’s killing who was indicted. SW: Well, and in these two most recent instances we’re seeing in places like the NY Daily News, which surprised me when it had the incredible front cover yesterday saying “We Can’t Breathe – Grand Jury Clears Choke Cop.” And then it goes through, and we find that the only person that’s indicted in this instance is the guy who took the video, who had the phone that recorded it. So what you’re saying is absolutely underscored. And our previous guest, Robin Kelley, was saying that this is a matter of several issues: one is institutionalized racism, and another which he talked about, and I’d like you to address as well, is this incredible expense of having this kind of policing, not just for the cops, but for the payouts, for all of the settlements, when there’s so much violence against civilians. AV: Yes. Well, it is expensive, and I think that’s just one kind of symptom of a politics of over-policing of communities of color. I mean, I think that the expense for taxpayers is not just in the payouts, but also in the maintenance of a massive law-and-order apparatus of courts, prisons, police, jails that largely serves the function of criminalizing young people of color for mostly very minor offenses with very little positive results to point to. SW: I asked this question of Robin Kelley, and I wanted to ask you as well: do you think that there would have been a difference had Michael Brown or Eric Garner been white? Would they have been harassed, would they have been killed? AV: Well, you know, probably not. It’s always hard to reduce this down to an individual case, or a pair of cases. But in the aggregate, we know that these kinds of occurrences just don’t happen in white communities. That the police have a different attitude about what kinds of tactics, behaviors, etc. is acceptable in communities of color. Now they will say this is because these are “high crime” communities? That might explain a desire to have policing activity in those neighborhoods, but it does not explain the constant everyday harassment, discourtesy, humiliation, much less abuse and violence that’s meted out. SW: But do you also think that the power brokers–in New York, for example, where you are–need to recognize that there’s a big problem, and that problem isn’t just that there’s some out of control rogue cops, and that they’re pretty expensive to settle the results of their behavior, but that looking at the protests that we’ve seen now for several days, and the resonance of public support for these protests, that people are losing their fear of the cops, and that in one sense, the police have been delegitimized? Would you say that? AV: I do think we have a crisis of police legitimacy, and I actually have a blog on my website by that title that is filled with videos that are emerging of people very much like Eric Garner, resisting the police harassment. Not attempting to flee, not attempting to injure the officer, but just saying “this is wrong, leave me alone, I’m not going to cooperate with you.” And of course, like the case with Eric Garner, these interactions then escalate to police use of force. Mostly the consequences are fairly minor: an arrest for resisting arrest, maybe a bloody nose. But sometimes the consequences are much worse. And this is because, I think a growing number of people in these overpoliced communities no longer view the hundreds of thousands of low-level arrests that they’re experiencing as legitimate. They see it as racialized harassment. And this is a major problem. And what I worry is what happens when onlookers do more than just take videotape of these interactions, because I’ve seen tapes where it felt like at any minute, the crowd is going to rush in and try to restrain the officers, and that is where situations could really badly escalate. SW: Well, you are seeing that in these demonstrations–I witnessed people shouting at the cops, and the cops sort of being silenced by it, because there’s so much, as you’ve said and I’ve said, of that kind of righteous indignation here about the patent injustice. But I wanted to ask you–you mentioned body cameras, things like that, there are a lot of reforms that could be enacted to change the situation. I would add, body cameras that can’t be turned off or concealed–maybe car cameras. Some people are talking about retraining the police, but in The Nation article you say maybe we just need fewer cops. And I’d like you to address for our audience what the Broken Windows policing is. What does it mean, and why should it go? AV: Well, I think the issue is not so much the number of police per se, although that is a factor, but what is their role. What are our expectations about the role of the police in managing crime and disorder problems, which can be real problems that need to be managed? But what we’ve had is a deeply conservative theory that becomes the kind of hegemonic way to think about crime and disorder, and that’s the Broken Windows theory. It is a product of neoconservative intellectuals in the early 1980s trying to come up with a way to address urban problems while dismantling social safety nets, redistribution programs etc. And the sort of artful twist they did was to say that the problems of cities don’t have to do with inequality, poverty, racial disparity, segregation. They are about the moral failings of people on the street. And the root of those moral failings are a kind of climate of permissiveness that emerged out of the social movements of the 1960s and ‘70s, and that the way to address the rampant moral permissiveness is to have the police come in as a new source of moral authority by vigorously enforcing public codes of conduct that may or may not have anything to do with what’s on the law books. The job of the police now is to maintain order through constant surveillance and harassment. And that’s really what the Broken Windows theory says. And what that involves is the police going out and making massive numbers of low-level arrests, ticketing people, constantly searching, harassing, and interfering with people. It’s an incredibly invasive and intrusive form of policing. And while relationships between communities of color and the police have always been deeply problematic, it really is a dramatic intensification of that relationship, in combination with the war on drugs and the war on crime, and all of this has fed what we know today to be mass incarceration–you know, the imprisonment of literally millions of people. And this is really what Michelle Alexander is talking about when she is talking about the New Jim Crow. It’s just an intensification of the police role. SW: And in fact, in the article that Robin Kelley posted on Counterpunch, he’s calling it essentially a war, a permanent war on the Black and Brown underclass. And that’s essentially what I’m hearing from you as well. So in this instance then, do you know–given that you research policing and study it–is there discussion of letting go of Broken Windows, of starting over? AV: Well, it’s like you asked me before, about the politics in NY. 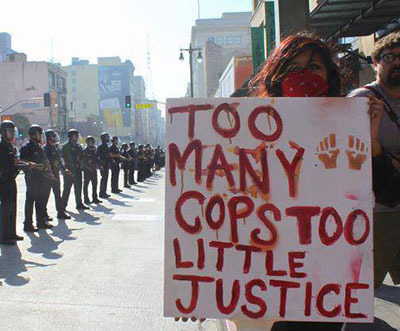 And this is sort of the litmus test, I think, for a lot of community activists and police accountability activists, is: are the politicians trotting out the same old ineffective reforms–of a little bit of training here, a little bit of diversity there–or are they directly addressing the massive expansion of police power? And primarily in the form of Broken Windows policing and the War on Drugs? And the reality is that most politicians in NY have been unwilling to directly address these issues. So they’re talking about body cameras, they’re talking about enhanced training, they’re even talking about enhanced accountability, which should be a part of the puzzle, but they’re not coming out and saying that the War on Drugs, Broken Windows, quality of life policing is a problem. And it’s a civil rights problem. I think the one important exception has been Congressman Hakeem Jeffries, who has specifically targeted these two areas in his public comments. SW: But do you see community policing as part of that rubric, or is it something that is a reform that we need? AV: Community policing, ironically, actually represents an expansion of the police role. Because typically, what community policing has come to mean is some kind of partnership between the police and the community, where the community brings its myriad problems to the police, and they try to come up with a solution. The problem is that when the only tool you have is a hammer, every problem looks like a nail–if the only partner that the community has is the police in solving their problems, then the solution to every problem looks like arresting people, coercing people, harassing people. And the availability of other kinds of options is never really on the table. There was a shooting of a young man [Akai Gurley] by a police officer here in Brooklyn, fatal shooting, in a stairwell in public housing. The officers are patrolling the stairwells with their guns out. These stairwells are in poor repair, the lights are out; the elevators don’t always work so people are using the stairs to get downstairs. They run into each other, and the officer’s gun goes off. Now, why is it that the problems of public housing are seen as police problems? Why aren’t we finding ways to empower the residents of public housing to, on the one hand, make sure the lights are working and the elevators are working, but also, finding solutions to their crime and disorder problems that don’t involve coercive armed police tactics? SW: Well, this is very important. I’d just like to alert the listeners that they should read your piece at The Nation website called “We Don’t Just Need Nicer Cops, We Need Fewer Cops.” You also debunk all the myths about reforms that could be put in place. You’ve just talked about community policing–and within that, there’s the community control of the police. And you also say that that’s not going to work. Can you tell our listeners why? AV: Yeah, this has been a rhetorical position of a lot of very mobilized, well-meaning accountability groups, community-based efforts etc. But the problem is that “communities” as currently constituted are really not in a position to carry out this task effectively. The fact is that most people are not interested in engaging in the complex, bureaucratic processes of overseeing an extremely complicated and somewhat hostile bureaucracy. But also, many communities would use community control as a mechanism for further racializing their policing, for walling off their communities from perceived threatening outsiders. And also, even in communities of color, places that are over-policed, the kinds of neighborhood residents who tend to populate community boards, community councils, etc. tend to be the older, more conservative members of the community with commercial ties to landlords and local businesses, and these folks are just not likely to be sources of significant changes in police power. Finally, if the real goal is to reduce police power, then we need mechanisms of control of city government as a whole, not just the police department. Because again, we don’t need to just alter the behavior of the police, we need to get the police function to be dramatically reduced. SW: Well, in your article you also mentioned–one of the things that’s begging a question we haven’t addressed, and that is the militarization of police with all of the surplus materiel from the war on terror. But you do talk about things like we need to get policing out of the schools, or that dealing with homeless people is not well done through the police. Robin Kelley made the point that on Skid Row in Los Angeles, more is spent policing it than on providing services that would alleviate it. AV: Yes, actually I wrote an evaluation of Skid Row policing in LA under Bratton in general, in Criminology & Public Policy, and there’s great research that shows that we spend more money on cycling people through emergency rooms, jails, and social services than it would cost to just give them permanent housing. And you also mentioned militarization, so I wrote a piece in The Nation over the summer–people can go to my website and find that–where I lay out, in part, a form of government welfare to defense contractors, that they’ve opened up a dramatic new market for them, and it has resulted in a kind of dramatic mission creep where SWAT teams that were created to handle very rare, barricaded-suspect type situations are now doing regular patrols, serving warrants, policing protests, etc. SW: We only have 30 seconds, but can you tell our listeners where your website is, and finally, what your idea of reform would look like. AV: It’s alex-vitale.info, and I’m @AVitale on Twitter. And I think that we really need to focus not so much on simple reforms of what the police are already doing. We need to ask some fundamental questions about what is the proper role for the police? And I think one way to start is the question of drugs and whether or not the police should have any role in that at all. Alex Vitale is an Associate Professor of Sociology at Brooklyn College and a specialist on policing. He is the author of City of Disorder: How the Quality of Life Campaign Transformed New York Politics and has written for Al Jazeera and The Nation. Alex is also a senior policy adviser to the Police Reform Organizing Project, and serves on the NY State Advisory Committee to the US Civil Rights Commission. Suzi Weissman interviewed Alex for her program “Beneath the Surface” on KPFK, Pacifica radio in Los Angeles, December 5, 2014. The interview was transcribed by Melieiz Figueroa and has been slightly edited.